Word Superhero - On Sale for just $4.99! 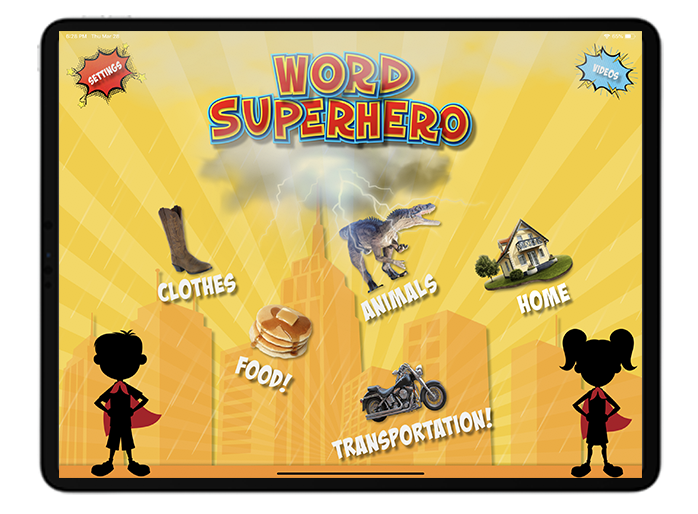 Word Superhero has students rescue items from a storm and return them to their proper home. By doing this, children learn to properly categorize items. In doing so, children improve their vocabulary and word recall while also improving their ability to answer WH questions and make associations. Speech Tutor Pro - On Sale! $39.99! iOS App: Over 5000 cards, screener, dozens of articulation videos, audio/video recording, data tracking, and tons of other goodies! All the same features of the iOS device but it runs on desktops and laptops in Chrome. Currently free while in beta. Dozens of articulation videos, audio/video recording, milestones & tips. See why this app is one of the most popular speech apps ever. Frustrated with waiting for insurance and/or schools to help your child’s speech? We want to put the power in YOUR hands so you can start helping your child at home. Right now. Today. Using our online technology, we can listen to your child’s speech and guide you on how to use our app to improve speech, along with tips to use in your daily life. Purchase a consultation and Get free lifetime access to Speech Tutor Pro. The consultation fee is $49.99 and comes with our mobile app (normally $40). Check out all the great features Speech Tutor Pro has to offer.